Saint Francis Hospital has proposed to the Muskogee Medical Authority, which controls the lease of the land the hospital currently sits on, that the land be given to Saint Francis instead of continuing the lease, which currently lasts until 2047. The authority unanimously rejected that proposal just now. The lease is designed to protect Muskogee and ensure healthcare availability here for the foreseeable future. If the hospital owned the land, the protections designed into the lease would cease to be valid and the hospital could do whatever it wanted. In 2007, the authority sold the hospital’s equipment and operating assets to Capella Healthcare, which then leased the land and buildings, creating the City of Muskogee Foundation with the money it used to enter the lease. In February of 2017, Capella transferred the lease to Saint Francis. As such, Saint Francis is bound by the original lease, which contains numerous protections for the people of Muskogee, who own the land on which the hospital sits. The hospital must pay annual “in kind” payments equal to ad valorem and real estate taxes; the bulk of those taxes go to fund schools. The tenant must continue to operate the hospital as a general acute-care hospital. They must maintain and expand existing physician and nurse medical education programs. They must maintain quality assurance initiatives and collect patient satisfaction surveys annually. The tenant must maintain the premises and make routine improvements. Any non-routine changes to the buildings or land must be approved by the Medical Authority board. When the lease is up, the tenant must turn over the premises to the authority in as good of condition as it was when the lease began. If the property is damaged by casualty, the tenant must repair it at its expense. If the tenant abandons or vacates the premises — including transferring a substantial portion of its operations, business or personnel somewhere else — the tenant defaults on the lease. Under the proposal from Saint Francis, however, the authority would transfer the title to the property to Saint Francis, terminating the lease. 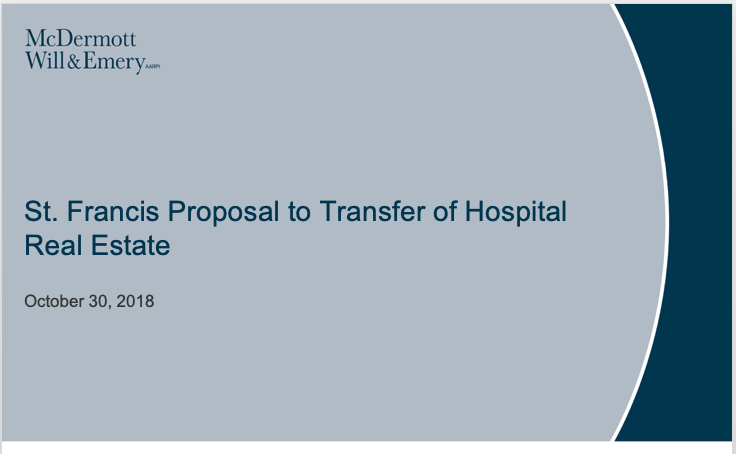 Saint Francis would invest $50 million in the hospital over the next five years, however, $20 million of that would be money the hospital already spent. Saint Francis would agree to continuing operating the hospital for five years. It would also pay the rest of 2018’s “in kind” payments (the ones that support local schools), but none after that. Under Saint Francis’s proposal, there is nothing compelling the company to continue operating the hospital after 2023. Under the current lease, it must continue operating the hospital until 2047. The board voted unanimously to reject Saint Francis’s offer. The board couched the vote as a way to protect Muskogee’s interests in the hospital.